Research has shown that an ergonomics process that identifies risk factors, devises solutions to reduce musculoskeletal disorders (MSDs), and evaluates the effectiveness of the solutions can lower worker exposure to risk factors and MSDs and improve productivity. A review of the Mine Safety and Health Administration (MSHA) injury/illness database indicated that 46% of illnesses in 2004 were associated with repetitive trauma and 35% of nonfatal lost days involved material handling during 2001- 2004. 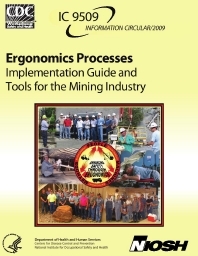 Even though these statistics show that MSDs significantly contribute to occupational illnesses and injuries in the U.S. mining industry, few mining companies have implemented an ergonomics process. Despite the many unique challenges in the mining environment, three mining companies partnered with the MSD Prevention Team at the National Institute for Occupational Safety and Health's Pittsburgh Research Laboratory to demonstrate that an ergonomics process could be systematically implemented and effectively integrated with existing safety and health programs. Because these three mining companies were very different in organization, culture, and size, the ergonomics processes had to be modified to meet the needs of each company. A description of how these three companies applied ergonomics and the tools and training used to implement their processes is given. Prior to discussing the case studies, general information on the elements of an ergonomics process is provided. Download the ZIP file and extract the resource materials to your local hard drive.